Regiment/Catrawd: Manchester Regiment 51st Bn. Ref No Grave or Memorial / Rhif cyfeirnod bedd: XII. D. 24. Drowned whilst bathing 25th May 1919. Having survived the war, it seems that he may have died in an accident, if anyone knows any different, please contact the web page. Photo sent by Mark Adams, many thanks to him. I found Thomas when I entered “Saltney” into the Commonwealth War Graves Commission database, looking for soldiers who may have been missed off any memorial, so as he is not on the Saltney War Memorial in St. Mary’s Church, I have added him to this list in the hope he won’t be forgotten. I cannot, up to now, find any Service Papers for him, they may have been lost in the bombings of the 2nd World War, when many papers were lost or burned, the ones remaining known as the “Burnt Papers,” therefore I cannot find out how and why he drowned. Taken from the ADAMS Family Tree (madam2094),Thomas BATEMAN was born 28th August 1898 in Manchester, Lancashire. He was the 3rd son of William T. and Charlotte Bateman (nee Aston). He first appears on the 1901 census, the family had moved from Wolverhampton, where they were living with Charlotte’s parents to 83, Gloucester Street, Chester. William,34,who had been born in Wolverhampton, was now an Iron Founder, previously, in 1891, being an Engine Driver. Charlotte, 31 had also been born in Wolverhampton. Their children, William Edward, 10 had been born in Rotherham. Son Alfred, 8, daughter Charlotte, 6 and son Thomas 3 had been born in Manchester, daughter Ellen had been born in Chester. The 1911 census shows the family living at No 2 Harrisons Place, George Street, Chester. (7 Rooms). Head of the household was William T. Bateman, 42, a Draper, who had been married to Charlotte, 41, for 21years, 10 children had been born and they were all still living. Charlotte, along with looking after the children also assisted in the business. Their children were William Edward, Single, 20 and a Plumber. 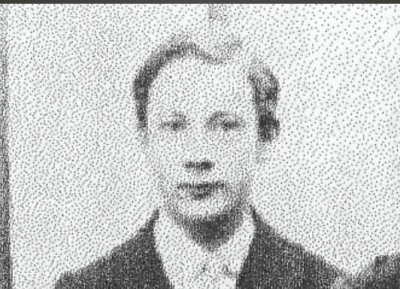 Son Alfred, single, 18 was an Electric Wireman, daughter Charlotte, 16 and Thomas, 13 and at School had been born in Manchester. Daughter Ellen, 11, Joseph, 9, Nathan, 7, Ruth, 5 Violet, 3 and baby Ethel, 7 months had been all born in Chester. Thomas Bateman in the British Army WWI Medal Rolls Index Cards, 1914-1920 confirms his regimental details above, but does not tell us when he entered the was or where he was stationed. Thomas Bateman in the UK, Army Registers of Soldiers’ Effects, 1901-1929 tells that the sole Legatee was his mother Charlotte who received £23 18s 10d on the 8th November 1919, this sum included his War Gratuity of £18 10s. This probably meant he hadn’t married. It also showed a Repayment to Regimental Paymaster at Preston (R.P Preston) a recharge of £2 12s. on 21st August 1919. This source also confirmed the CWGC information that his death date was the 25 May 1919 and he drowned whilst bathing. Death Place:Menden, Germany. Commonwealth War Graves Commission additional information:Brother of Mr. W. E. Bateman*, of Dalmeny, Saltney, Chester. 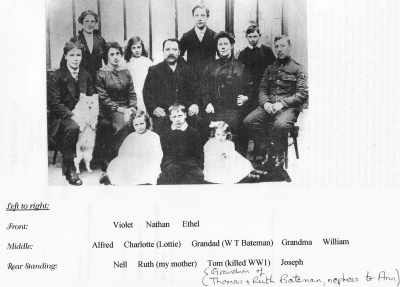 * William is in the Army uniform and he married Ellen CLIFFE on the 12th December 1922, giving his address as “Demeny,” Chester Road, Saltney, Flintshire, his father being William Thomas BATEMAN. They were 32 and 36 years respectively, William was a Mechanical Engineer and Ellen was Head Laundry Packer, her father was Edwin CLIFFE (Deceased).